On Saturday, June 3, 2017, from 9 AM – 3 PM, The Newark Arts Education Roundtable (NAER) will present Developing Creative Minds: A City-Wide Arts Education Summit designed for the Newark community to learn about city-wide arts opportunities and initiatives. Recommended for persons of all ages, the summit will feature performances from Newark students, arts workshops for children and teens presented by NAER member organizations, and key advocacy discussions facilitated by the New Jersey Arts Education Partnership, NJ Arts Census and more. 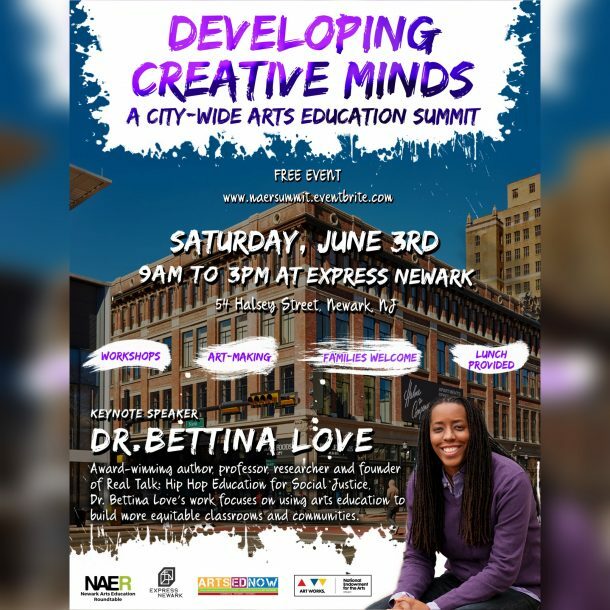 Special guests include keynote speaker Dr. Bettina Love, an award winning author, professor, researcher and founder of Real Talk: Hip Hop Education for Social Justice who will hold a Q & A session with Newark youth, following her keynote. SECOND ANNUAL RUTGERS-NEWARK CONFERENCE ON YOUTH DEVELOPMENT AND JUVENILE JUSTICE -- FRIDAY, JUNE 9! Rutgers-Newark announces the Second Annual Conference on Youth Development and Juvenile Justice on Friday, June 9th, 8:30am to 5:00pm. This year’s conference boasts an engaging and informative set of presentations, including a talk on juvenile interrogation by Professor Steven Drizin (of "Making a Murderer"); a talk on mental health and trauma screening in the juvenile justice system by Professor Keith Cruise and a presentation plus special announcement on juvenile justice reform in New Jersey from Dr. Jennifer Lebaron. The conference will be held on the campus of Rutgers University-Newark on Friday, June 9. Discounted parking is available, and the registration package includes breakfast snacks and lunch! Any questions or concerns may be directed to Rutgers program assistant, Sheila Solano, at shsolano@psychology.rutgers.edu or 973-353-3932. The Newark Trust for Education believes in the power of community; the power of individuals to inform decisions that impact the day-to-day learning lives of our young people. Have your voices heard in selecting the three new members of Newark’s School Advisory Board tomorrow, April 25, 2017, election day. The City is facing a critical moment in determining who will host the educational conversation in Newark that will inform our movement into a new era, an era of local control. Do not be left out. Vote tomorrow. Read more about the candidates at Newark Trust for Education’s Campaign Central. Listen to the podcast of the candidates forum by clicking here.